Nuts are one whole food that has been given a bad rap, but now Australian research has cracked these myths wide open revealing the role nuts play in protecting your heart. Since the low-fat eating era that started in the 1980s, many of us have banished nuts from our diet. But thanks to a new Australian review of more than 100 studies spanning 20 years, it’s time to start enjoying these crunchy delights again, minus any hint of guilt. The extensive systemic literature review on nuts and heart health was conducted by researchers from Landmark Nutrition and the University of Wollongong and found regular nut consumption is associated with a reduced risk of death from heart disease and a reduction in heart disease risk factors. “The review establishes that regular nut consumption as part of a healthy diet is associated with a reduced risk of death from heart disease and a reduction in risk factors for heart disease, in particular cholesterol,” said leading nutrition academic and review co-author Professor Linda Tapsell. Being heart friendly isn’t the only benefit of regularly eating nuts however, with these benefits being seen without any adverse effects on weight. “The contribution of nuts to a healthy diet can be easily underestimated. They’re often relegated to a snack food category and sometimes avoided by people trying to lose weight. This scientific evidence provides a very different perspective that deserves attention,” added Professor Tapsell. Nuts For Life, Australia’s leading nutrition authority on tree nuts and health, commissioned the review, which provides evidence to support the general health claim that daily nut consumption as part of a healthy, varied diet contributes to heart health. Nuts For Life Program Manager and Advanced Accredited Practising Dietitian Ms Lisa Yates said to take advantage of potential heart health benefits 30 grams or a handful of nuts a day, serves well as part of a healthy diet. But, in Australia nut consumption falls a long way short of the recommended serving of 30 grams, with the recent Australian Health Survey 2011-2013 showing that on average Aussies eat just 5-6g of nuts on the day of the survey. This means that to get the heart health benefits Aussies need to increase their nut consumption by 350%! So just why are nuts so good? “Nuts are nutrient dense and rich in bioactive components many of which may contribute to heart health benefits such as healthy fats, plant omega-3 ALA, fibre, vitamin E and phytochemicals with antioxidant properties. The amino acid arginine aids endothelial function by helping blood vessels to dilate and remain elastic, as well as helping to prevent blood clots,” explained Yates. When it comes to the weight management benefits of nuts, there are a number of mechanisms contributing to this attribute. Nut have the ability to keep you satisfied for longer, thanks to their protein, fat and fibre content, as well as their ability to release satiety hormones in the intestine. Despite being high in kilojoule-rich healthy fats, research shows you won’t absorb all the fat found in nuts either, with up to 20% being lost through faecal fat excretion. This happens because the nut cell wall resists digestion. Finally, adding nuts to meals with carbohydrates will also lowers glucose levels after a meal, which works to reduce appetite. With all this positive news surrounding nuts, it’s time to put nuts back on your menu. You can do this by including your favourite variety, either raw or dry roasted, each day. 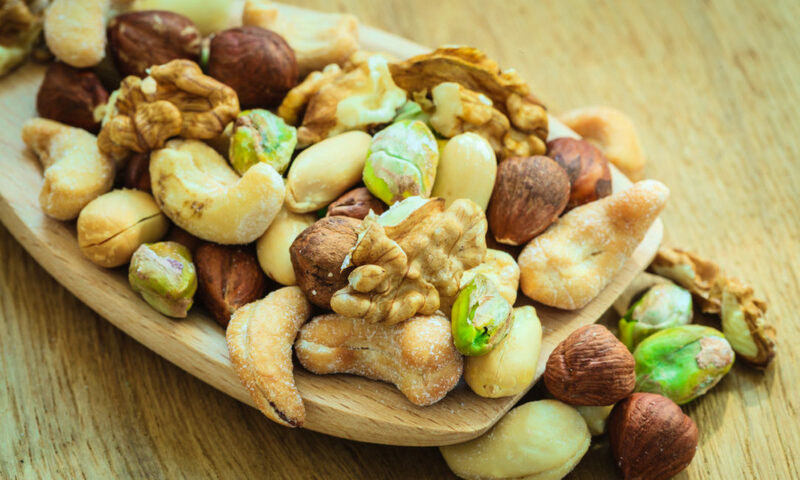 Enjoy your favourite nuts either as a snack, sprinkled over your breakfast cereal, added to a stir-fry, chopped through a salad or topped on your favourite dessert or muffin. It’s a simple way to add nutrient-rich taste to your day.